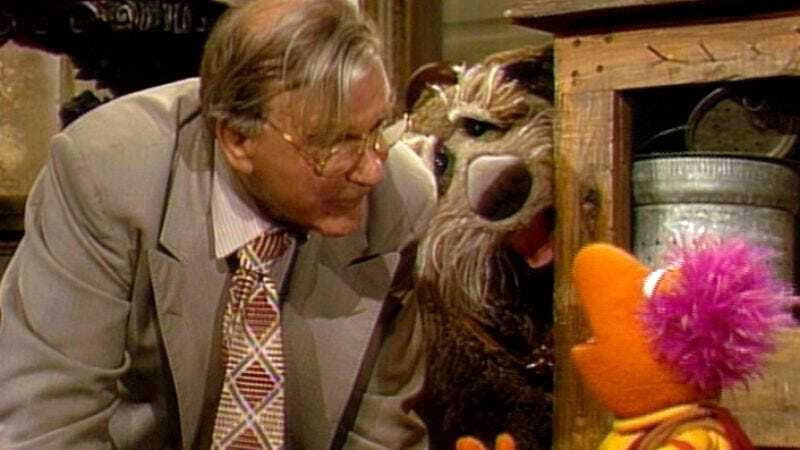 When longtime Jim Henson and Fraggle Rock writer Jerry Juhl depicts Doc (Gerard Parkes)—the show’s surrogate for us humans or “silly creatures”—seeing Gobo Fraggle (Jerry Nelson) for the first time, it’s no small moment. Doc’s hapless dog, Sprocket, has been telling his owner about the Fraggles since the first episode of the show, without Doc ever actually viewing one in the flesh. It’s the children’s-show equivalent of Ted Mosby finally telling his kids how he met their mother. And with Doc and Sprocket about to move away to the desert to tend to a sick friend, Gobo’s arrival comes just in the nick of time. Doc still leaves—after all, the man is unwaveringly loyal to his friends—but he does so with a heavy heart, sad that he can’t bring the Fraggles’ world with him to his new home. In a way though, he’s done that very thing without even realizing it. As Gobo later discovers, there’s a hidden meaning in the Trash Heap’s words, a meaning that leads to an eventual reunion, if perhaps only in the spiritual sense. “You cannot leave the magic” doesn’t mean you shouldn’t let someone move away. It means that the memories and magic they’ve brought to your life will still be with you after they’re gone. That message is even more poignant when watching “Change Of Address” today. Jerry Nelson died in 2012, and Parkes just this past October. That’s to say nothing of the also-deceased Juhl, Fraggle Rock director and cast member Richard Hunt, and, of course, Jim Henson. And yet, like any artist, their spirits live on in the work they left behind. We’ve had to say goodbye to them as people. But we never have to say goodbye to their magic. Availability: “Change Of Address” is available as part of the Fraggle Rock: Complete Series Collection DVD set. It’s also currently streaming on Hulu Plus.